The introduction of this new capability provides screening labs with a unique alternative to fully automated robotic liquid handling systems as the VIAFLO 384 is the only benchtop pipette on the market, which allows easy and precise pipetting into 1536 well plates. Most screening assays start in larger formats (96 - 384 well plates) before they are up-scaled to the 1536-well plate format. For assay development, fully automation robotic systems are often not the best choice because they are costly, typically complex to use and require long set-up times. In the assay development phase, when not as many plates need to be processed, a quickly adaptable and easy-to-use benchtop pipetting system offers a superior choice. The VIAFLO 384 is a handheld 384-channel electronic pipette that enables fast, precise and easy transfer of 384 samples simultaneously. 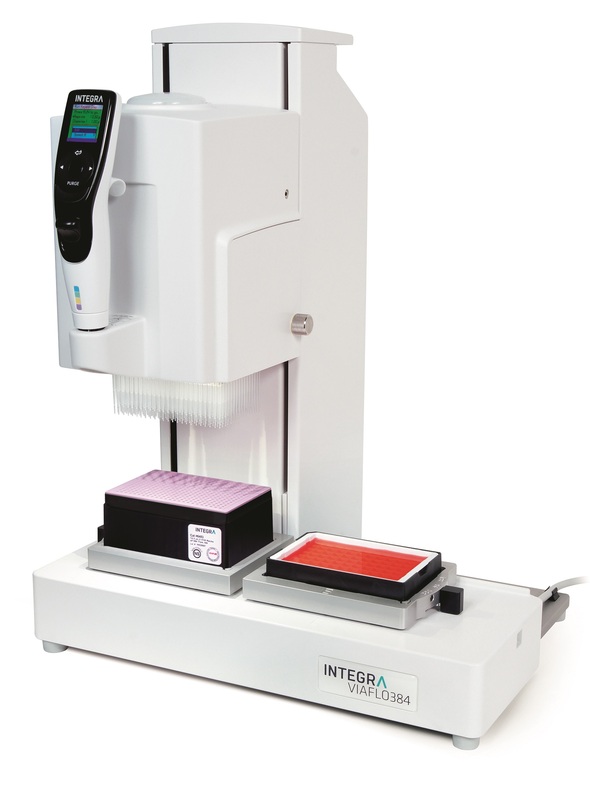 Uniquely the VIAFLO 384 offers all the benefits of increased sample throughput as well as lower sample and reagent use without the expense of having to invest in a robotic liquid handling system. The VIAFLO 384 has been designed to be used just like a standard handheld pipette. Therefore, no special skills or training are required to operate it. Servo assisted motor steering ensure that operating the VIAFLO 384 is both effortless and precise. The VIAFLO 384 features the company's popular Touch Wheel™ pipette user interface enabling simple and fast programming of a wide range of pipetting modes including repeat dispense, serial dilute and mixing routines. The VIAFLO 384 comes with 10 pre-defined pipetting modes enabling the system to be used productively almost immediately. A further 40 user designated custom programs allow even the most diverse and complex pipetting operations. The VIAFLO 384 can be connected to a PC with VIALINK software enabling easy custom program exchange and firmware upgrades. Labs will immediately benefit from the increased productivity and high precision delivered by a VIAFLO 384.